How T-Box (a telematics solution) works? Telematics Control Unit (TCU), a hardware and software solution for telematics system development, is designed to fetch vehicle data. This data is stored and processed in a Cloud Telematics Server. Telematics Mobility solutions (web-based and mobile app) for insurance telematics, fleet management system, asset tracking and more are integrated with this cloud-based telematics server. At Embitel Technologies, we have been collaborating with global automotive companies as their trusted R&D and Embedded Technology partner for the last 10 years. Our unique organization structure has enabled us to leverage our cross-functional expertise in Automotive, Embedded software/hardware and Cloud and Mobile technologies to help customers realize their product roadmaps. Why T-Box Platform for Telematics Product Development? 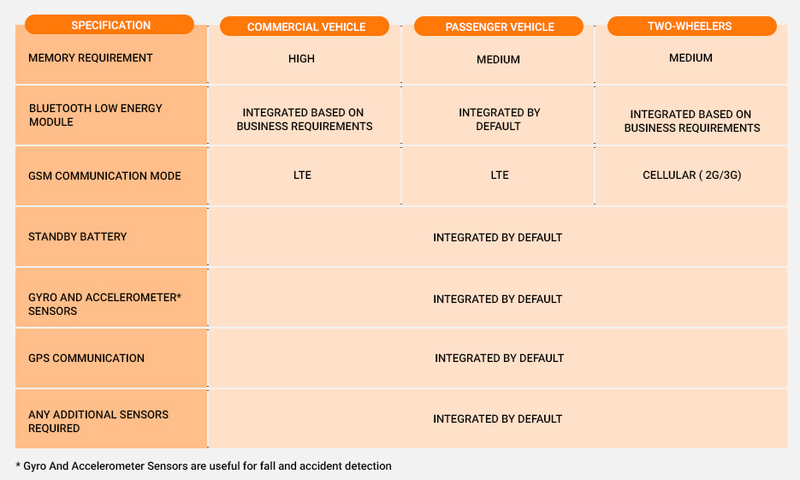 Can you share details regarding the compatibility of your Telematics Solution with various vehicle types? Ans. Our Telematics Solution (T-Box Platform) is compatible with Commercial Vehicles, Passenger Vehicles – including four/three/two wheelers. T-Box platform is compatible with both combustion engine as well as Electric Vehicles. From a design perspective, a telematics solution for commercial vehicle would be more feature intensive while the one for a two-wheeler would be cost-sensitive. What are the re-usable components from your Telematics Reference Design, which can be leveraged to build a customized solution? Ans. We have partnered with an Europe based Fleet Management Solution Provider for integration of telematics solution with their Android infotainment system of their Electric Scooter. We can share more details regarding this partnership along with other customer success-stories after signing an NDA. Do you provide support for AIS 140 compliance for Telematics Product Development? Do you provide support for ensuring functional safety compliance for the Telematics Products? Ans. Yes we do. Our in-house ISO 26262 Functional safety Consultants will assist you in implementing ISO26262 recommended Functional Safety practices. This will be based on ASIL requirements for your hardware & software components. Our Automotive Functional Safety team can also provide support in identifying the ASIL requirements. Can you provide support for migration from proprietary OS, like Windows C to Open Source OS like Linux? Ans. Definitely we can. In fact, we have partnered with leading brands from the automotive industry - tier 1 suppliers, electric scooter manufacturers and others; for successful porting of their telematics solution from proprietary OS like WinC to open source platforms including Linux and Android. Tech behind Telematics Explained: How does a Vehicle Telematics Solution Work?